Waterfalls have been an awe-inspiring sight ever since the first man walked down river, peered over the edge, and then wildly exclaimed to his tribesmen, "I think we can jump off of this!" So it's with the same passionate spirit of adventure and danger that we're proud to introduce the most treacherous, powerful, and enormous waterfalls in our big, beautiful world. 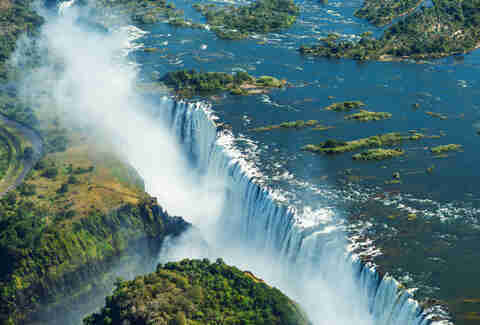 Considered the largest waterfall in the world, Victoria Falls thunders obnoxiously in Southern Africa. A Scotsman named David Livingston "discovered" the falls around 1855 and named them after then-queen Victoria. When the locals told Livingston they'd known about the falls for years, calling it "the smoke that thunders", Livingston straight up preached about Christianity for about 20min and everyone just kinda walked away. In Spanish, "ventisquero" translates to a zone in a mountain where heavy snow accumulations occur. That's not really relevant to anything, but hey! The more you know! 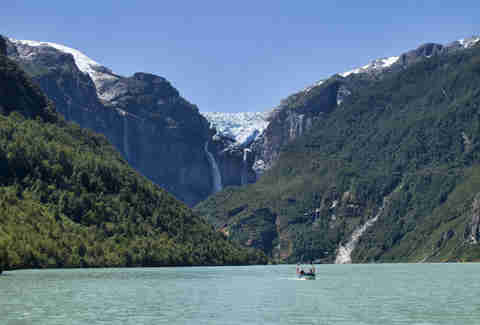 What makes this waterfall particularly unique isn't the fact that it's in Chile (try harder Chile), but that it flows from a 50,000-year-old freaking glacier. That's ablation, baby! 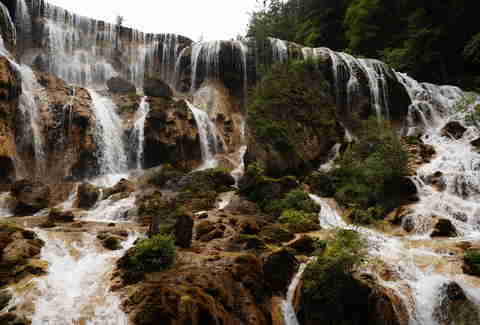 You can find this beaut in "Ngawa Tibetan and Qiang Autonomous Prefecture", which is basically the Las Vegas of Sichuan Province (probably). Fun fact: the falls are located in the same area as Five Flower Lake, which appeared in the film Hero, and that was a super dope movie. Named after what happens when Kiefer's knocked back a few cold ones -- and strongly resembling a Bob Ross painting -- this magnificent water-fueled gravity-verifier pours out of a badass mountain lake at one of the South Island's most picturesque destinations. 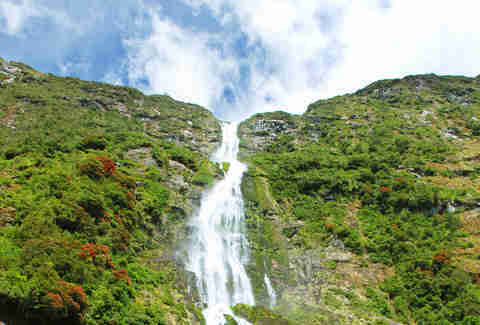 The falls extend 1,904ft, making this one of the tallest in the world (and one of the nicest in our hearts). Niagara Falls looks like it used to be a giant lake, but then half the lake gave up and sunk, accepting that "this is just who I am now". 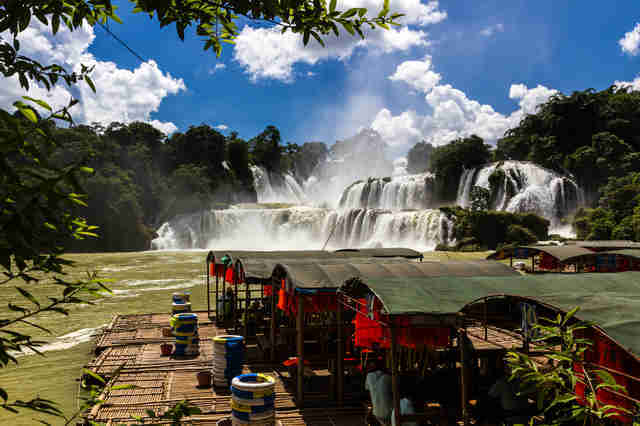 The result is one of the most recognizable falls in the world. Consisting of three individual waterfalls (Horseshoe Falls, American Falls, and Bridal Veil Falls), Niagara has seen countless "daredevils" construct barrels for upwards of $30,000, only to plunge 165ft into the waters below. Which makes total sense when you look up the word 'idiot' in the dictionary. 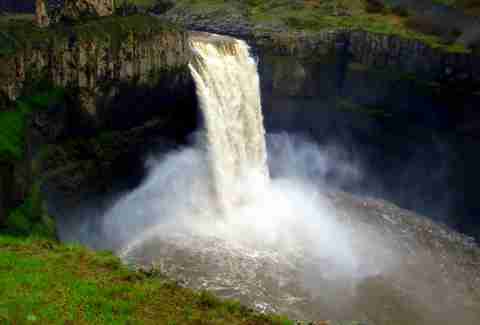 Dropping 198ft, Palouse Falls is part of the eponymous park located in the bear-infested state of Washington. The falls received a quick bout of fame after pro kayaker and all-around badass Tyler Bradt set a world record for the largest descent over a waterfall. This drop clocks in at 17ft higher than Niagara. Where you at, Canada?! 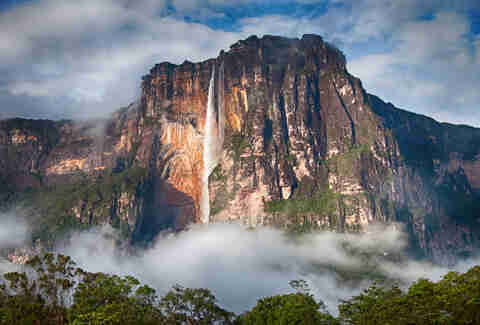 Angel Falls is the world's highest waterfall, clocking it at 3,212ft, and is a UNESCO World Heritage site. It got its name from Jimmie Angel, the first person to fly over it and subsequently crash land on top of it. After Jim got out of his plane, he let out a big ol' "Oh screw this!" and walked for 11 days down to the bottom, where folks were fascinated by his story and decided to name the waterfall after him. 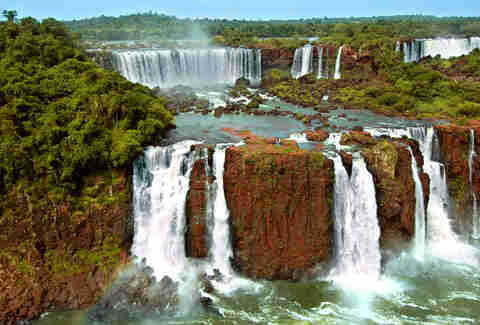 Literally translating into "big water," Iguazu is one of the widest falls in the world. And, if Canada hadn't already been taking it on the chin for the last, like, three waterfalls, former First Lady Eleanor Roosevelt went to Iguazu and was all, "Poor Niagara!" Also, no dumb wealthy guy was ever like "let's ride a barrel over Iguazu! ", because if he did, everyone would laugh at what a big dumb idiot he is. This gigantor overcompensates for its relative lack of popularity by being 4x taller than Niagara. 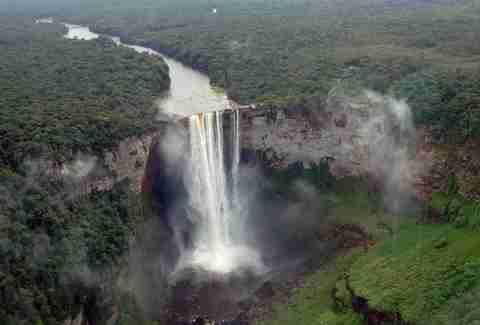 Located on the Potaro River in central Guyana, the falls gained their name from a Patamona Indian legend in which Kai, a chief, wanted to save his people by paddling over the falls in an act of self-sacrifice to Makonaima, the great spirit. Where you at, Tyler Bradt?! 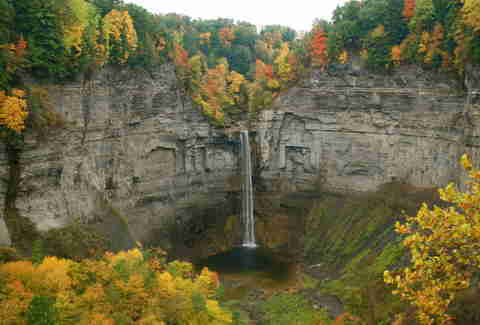 Taughannock champions the arbitrary role of "largest single-drop waterfall east of the Rockies", which is cool if you're really into waterfall competition. The waterfall's situated in a NY State Park and is only accessible by trail, but take note, hikers; "swimming is strictly forbidden". Leave your barrels at camp for this one. Ok, ok, so this one time, this awesome band from the '90s that everyone was into named "Live" (and don't even say you didn't like them, because that's a flagrant lie) filmed a music video here for the song "Heaven," which was just awful. This guy and this girl love each other, I think, but they can't get to each other because this behemoth waterfall separates them, so the guy jumps in and attempts to swim to her... He obviously can't make it, so the chick decides she'll jump in too and then they both die. 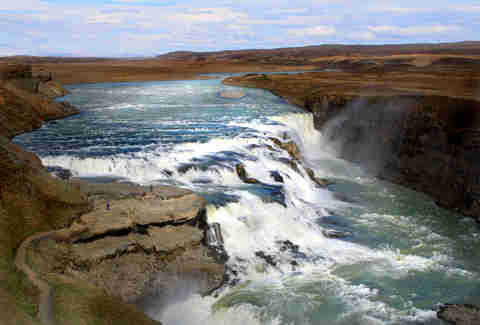 Also, this waterfall's name means "Golden Falls" in Icelandic, in case you were wondering. Trickling majestically down the rocks, Ban Gioc-Detian only drops a measly 98ft, but is super awesome looking, so size doesn't really matter. Back in the day, when people used to call other people "bandits", the falls were used as a hideout, and to this day treasure is still being unearthed in the cliff's caves. Shhh... you hear that? That's the sound of a bald eagle singing the National Anthem whilst chowin' on a cheeseburger. It doesn't get much more American than this. 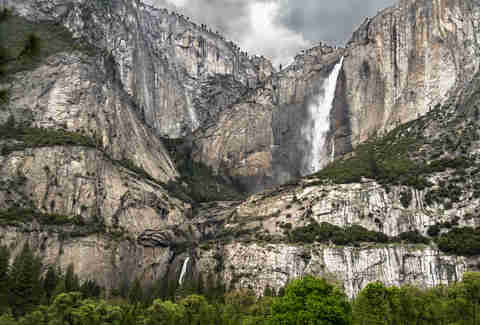 Yosemite Falls is the highest measured waterfall in North America, f*** yeah! However, there's a pretty creepy legend about these falls: the Ahwahneechee people believed that the pool at the bottom was inhabited by a bunch of witches. And there's this tale that a woman went to fetch some water from the pool, and after reeling in her bucket, it was full of snakes! Gross. The witches were still torn up that this woman had the audacity to want some water for her and her child, so later in the night they sent a strong wind to blow the woman's home into the water, taking her and child with it. Bottom line -- if you venture here, bring a Klean Kanteen. Leave it to the Croatians to really tell it like it is. 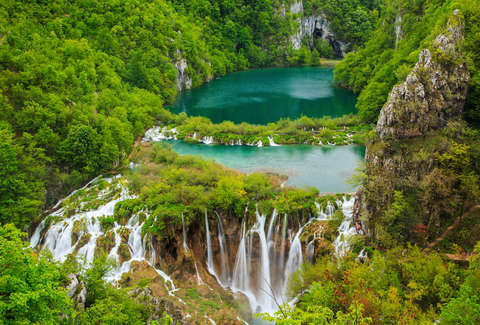 Named after itself, Large Waterfall can be found majestically dumping water all over various portions of picturesque nature, in the oldest national park in Southeast Europe. The surrounding area houses an abundance of animal species such as bears, fish, and those elven archers from LOTR. Welcome to Heinanova Mountain! In this wonderful place, roofs are thatch, Viking lore is abundant, and no one cares about Taylor Swift; it is indeed an alluring destination. 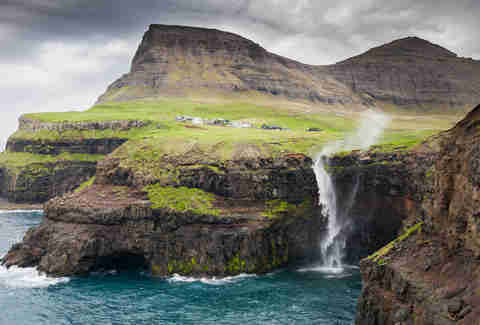 Most locals call this fall "the waterfall on Gásadalur", which is a little uninspired, but whatever. Cool facts alert! In 2002 there were only sixteen people living here, so you'd be super popular if you went to visit. And, allegedly, the village was named after a woman named Gæsa, from Kirkjubøur. She ate meat during Lent and, since that's wildly unholy, all her property was confiscated. Talk about harsh! There are also tons of stories about spirits and elves floating around here. Those 16 locals sure have a lot to say. Alex Robinson is a Cities Editor at Thrillist and a Florida native with a penchant for the outdoors. If not in riding a bike around Brooklyn, you'll find him in a tent, on a river, wearing a tank top and incorrectly reciting John Steinbeck. This article was originally published on September 3, 2013.